American-born al-Qaida cleric Anwar al-Awlaki was killed Friday by a U.S. airstrike in Yemen, administration officials say. Awlaki, 40, was among the terrorist group's most charismatic figures, expanding al-Qaida's violent theology to a new pool of potential recruits by speaking and writing in English. He also was tied to a series of attacks, including the Fort Hood massacre and the attempted bombing of a Detroit-bound airliner on Christmas Day 2009. An Associated Press dispatch calls the strike "the biggest U.S. success in hitting al-Qaida's leadership since the May killing of Osama bin Laden in Pakistan." To a Western audience, he was the most visible figure in al-Qaida in the Arabian Peninsula (AQAP), an al-Qaida affiliate considered the most dangerous and capable of carrying out terrorist attacks. This could have largely been due to Awlaki's English fluency and his deep-rooted understanding of American culture—having hailed from New Mexico and spent much of his adult life stateside. Thus, he understood the concerns of many young Muslim Americans and knew how to manipulate them. His true operational and leadership roles are disputed, though, with many regional experts suggesting his position in the terror group has been grossly overhyped in Western media. The Arabian al-Qaida affiliate was officially formed in January 2009 after bin-Laden confidant, Nasir al-Wuhayshi, united the peninsula's Saudi and Yemeni al-Qaida branches. Since then, Wuhayshi has remained the head of AQAP, leading internal revolts against the Yemeni state and "expanding the group's focus to conduct attacks on U.S. soil," along with military commander, Qassim al-Raymi. Numerous reports have surfaced over the past year claiming that members of AQAPs senior leadership had been killed in one fashion or another. All those reports appear to have been disproven, and the group's central leadership appears to remain intact. Others believe Awlaki's death will have a significanly larger impact due to his profile. "This is an extraordinary victory, a great moment for the United States. Al-Awlaki, has become more dangerous than bin Laden," U.S. Rep. Peter King, R-N.Y. and chairman of the House Homeland Security Committee, told Politico. "Over the last year, he's become the No. 1 terrorist in the world." Another AP report indicates the attack killed a second American; former North Carolina resident Samir Khan, dealing a crushing blow to the al-Qaida affiliate's global recruiting operation. Khan published seven issues of Inspire magazine, the latest earlier this week. A slick publication with high quality graphics, Inspire offered a mix of articles glorifying jihad, offering religious justification for attacks and providing detailed instructions for "lone wolf" terrorists to wage attacks inside the United States. A similar report of Awlaki's death in late 2009 turned out to be false. In this case, senior government officials have confirmed the attack and briefed congressional leaders like King. Officials also are hoping to match Awlaki's DNA with relatives still living in Virginia. 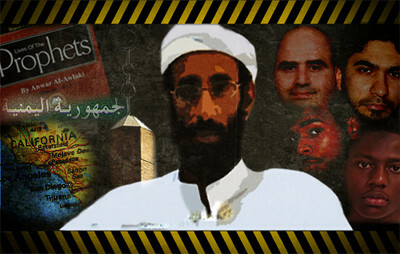 Before leaving America in 2002, Awlaki was considered a moderate voice. After the 9/11 attacks, National Public Radio cast him as someone who could "build bridges between Islam and the West," and a voice for moderation. He was even invited to give a presentation at the Pentagon in February 2002. But, as the Investigative Project on Terrorism reported last year, recorded sermons from that era show he already was spreading a radical message inside the United States. For more on Awlaki's role as an inspiration to terrorists click here. In the war on terror, Due process is a missile on time and on target. If terrorist or American citizens dont want to be smoked then dont engage in terror. There is no question whether he was a terrorist. He confessed each time he made one of those idiotic videos. This is a war not a criminal act. In war you kill the enemy period. Those in Gitmo should be tried by military tribunal like we did the Nazis, hanged and move on to the next one. Gitmo should stay open an a symbol of what happens if you screw with America. If we cant get you in Gitmo then fire will rain from the sky on you and yours. Terrorist only understand and respect the gun and the sword. Anything else is perceived as weakness. The Kings rules have no place in this war. Not a single shred of proof, all speculation! This is nothing but murder. But wait, it aint an American citizen so why bother, move on.